The secret to Maryland’s second consecutive Big Ten Tournament appearance is, well, anything but a secret. A starting rotation comparable to any in the country features three top-notch arms. Their 2015 NCBWA first-team All American and 2016 preseason Golden Spikes watch list candidate, Mike Shawaryn, is their third-best pitcher. That’s the type of season it’s been for head coach John Szefc and his three-headed pitching rotation. Two sophomores, Brian Shaffer and Taylor Bloom, comprised the remaining two weekend slots. Each of Maryland’s three starters rank in the top 19 in ERA in the Big Ten, combining to allow just 89 earned runs in 279.2 innings, good for a 2.86 ERA. Looking at Bill James’ Game Score, a metric that quantifies the effectiveness of any starting pitcher’s outing, we can see just how masterful these three aces have been when at their best. Game Score calculates the overall dominance of a starter’s outing and is relatively simple as far as advanced statistics are concerned. Each pitcher begins with 50 points, and by weighting different measures such as earned runs allowed, outs recorded and strikeouts, a final score is given to encompass the entirety of a pitcher’s contributions in any given start. The full calculation and weighting can be seen to the right. For reference, if we assign average stats to a “quality start”—six innings, three earned runs allowed and six hits, two walks, four strikeouts—that pitcher’s Game Score would remain 50. The following graphic breaks down the best start of the season for each of Maryland’s three aces according to Bill James’ Game Score. On the heels of a 13-2 2015 season (1.71 ERA) that propelled the right-hander atop the school’s all-time wins leaderboard, it looked as if “The Unicorn” picked up right where he left off this spring. 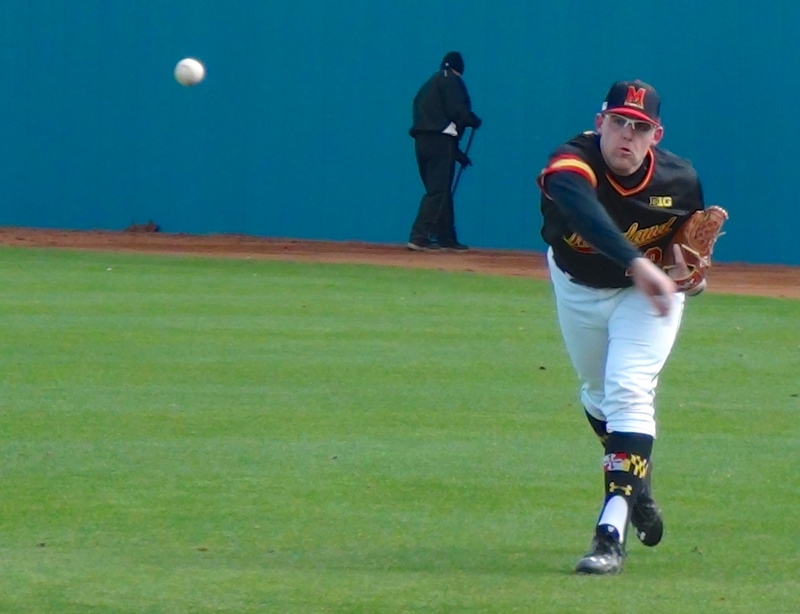 In the Terps’ home opener February 26 against Rhode Island, Shawaryn dazzled, facing the minimum over eight innings without allowing a hit after the first. Connor Foreman, the Rams’ only base runner on the day, reached base in the first and fourth innings. After Foreman’s single in the first he was immediately erased on a 4-6-3 double play. Shawaryn started to roll beginning with the twin killing, putting the next 10 hitters in two-strike counts. When Foreman reached in the fourth on a hit by pitch, the following batter lined into a 6-3 double play. Shawaryn set down the next 13 hitters in a row to complete his afternoon. The game marked just one of two starts on the year in which Shawaryn didn’t walk a batter (May 7 vs. Illinois) and didn’t surrender a run (April 23 vs. Purdue). In the latter, he tied his season-high Game Score of 85 in a 10-strikeout, three-hit performance. The Terps needed every bit of Shawaryn’s dominance that Friday afternoon. Opposing him was Rhode Island’s Steve Moyers, who threw an eight-inning complete game allowing just one unearned run in Maryland’s 1-0 series opening win. The best start of Bloom’s breakout sophomore season came on April 8 in game one of a double header against Ohio State. In the first Friday start of his career—stepping in for a struggling Shawaryn—Bloom took a perfect game into the sixth en route to a 90-pitch Greg Maddux complete game shutout. The nine-inning effort was good for his third on the year to that point. By season’s end, his five complete games led the Big Ten and tied for seventh in the nation. Other than Rutgers’ Howie Brey (four), no other pitcher in the conference had more than two. At 1 hour and 42 minutes, the game was the shortest of Maryland’s season. Shawaryn’s start against Rhode Island was the second shortest (1:52). The dominant start lowered Bloom’s ERA to 1.99 and raised his innings total to a Big Ten-leading 58.2. Exactly one month later, his ERA was identical and led the Big Ten. At the regular season’s conclusion, he ranked third in the conference with 95 innings pitched despite a gimpy ankle scratching him from the Purdue series. Had he pitched and lasted his average of 7.1 innings, he would have finished with the most innings pitched in the conference. Shaffer overpowered Rutgers with a career-high eight strikeouts and fell one short of a career-best with 12 groundball outs. Including an infield pop out, 21 of his 24 outs recorded didn’t leave the infield. He didn’t allow a hit through the first 3.1 innings, keeping Maryland in the game long enough for their feeble offense to break through against Rutgers’ starter and take full advantage of a weaker bullpen. The Terps broke a scoreless tie, putting up runs in the bottom of the sixth, seventh and eighth innings. Building off his breakout performance in last season’s Big Ten Tournament in which he snapped Illinois’ conference record 27-game winning streak, Shaffer emerged as a formidable weapon for Szefc worthy of pitching any day of the week, let alone as the Sunday starter. In six starts between March 13 and April 16, he lasted no fewer than seven innings and tossed consecutive complete games in his best 2015 Shawaryn impression (1.67 ERA, 0.82 WHIP). In a crucial spot, Shaffer spun his best game of the season, topping his complete game shutout of No. 23 Cal State Fullerton in which he posted a Game Score of 80, the fifth highest for any starter this season. Interestingly, Shaffer didn’t hold the best per-start average in any of the categories that dictate Game Score, but averaged the highest Game Score per outing at 59.5 (Bloom 59.23, Shawaryn 54.35). His consistency at the back end of the rotation proved vital for the Terps who went 9-5 in games the sophomore started, and explains how, without having the best numbers in any of those six stat categories, his average Game Score was highest. As further evidence of Shaffer’s reliability, the standard deviation of his Game Scores (15.98) was nearly identical to Bloom’s rotation-best 15.66. Using the Game Score metric, Shaffer led all Maryland starters with seven outings that scored 60 or higher. Bloom had six. Bloom posted five Game Scores over 70, Shaffer had four, and Shawaryn just three. However, only Shaffer and Shawaryn had multiple starts scoring 80 or higher. Each starter had four outings that scored between 50-59. Both Shaffer and Bloom had just three starts with Game Scores under 50, compared to Shawaryn’s six, and Bloom was the only one without a Game Score below 30 on the season. No Maryland starter’s Game Score was higher than Shawaryn’s two games of 85. He and Shaffer were the only two pitchers to post back-to-back starts that scored 78 or higher. Despite making just four starts on the year, freshman Hunter Parsons cracked the Terps’ top ten Game Scores, posting a 72 after a seven-inning, two-hit outing against James Madison for which he earned Big Ten Freshman of the Week plaudits.